AuthorMitaliPerkins: Gathering For Afternoon Tea? Have I Got A Book For You. Gathering For Afternoon Tea? Have I Got A Book For You. 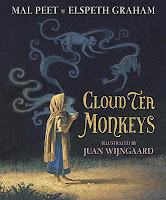 Cloud Tea Monkeys (Candlewick) by Mal Peet and Elspeth Graham is a tale about a compassionate, spunky, animal-loving girl about nine or ten. Know any girls like that? Then please invite them for afternoon tea and biscuits and read Tashi's story aloud. More than a fairy or folk tale (even though it was an accolade book for the Aesop prize), this engaging child-centered story depicts clearly the source of our tea. Set in a Himalayan community, neither the story nor illustrations stint on the labor required from women and children to grow a product that many of us take for granted. Let your guests savor the glowing, gorgeous illustrations by Juan Wijngaard as you're transported to the faraway world of tea gardens, but you might also ask questions about how hard the women have to work and why Tashi isn't going to school. Encourage children to learn about fair trade tea—it's a concept most of us can grasp at a fairly young age. Here are some free curriculum and great teaching suggestions from Equal Exchange, and enjoy this video from the people at Art of Tea.